Cost to polish a stone floor varies greatly by region (and even by zip code). Get free estimates from floor polishing and sanding contractors in your city. Cost to polish a stone floor varies greatly by region (and even by zip code). Get free estimates from floor polishing and sanding contractors in your city. The average cost of polishing a 200 sq.ft. stone floor is $600. How much does it cost to polish a stone floor? Natural stone floors have a beauty and durability unlike anything else on the market today. Stone comes in a wide range of different colors, patterns, styles, sizes, and finishes, which means that you can create an elegant, formal entryway or a rustic kitchen and regardless of stone type, your floor will last for years when properly maintained. Not all stones are strong enough to be polished, but some of those that are may also be subjected to something called etching. This phenomenon occurs when a highly acidic, alkaline, or abrasive substance comes in contact with the weaker particles of the stone's surface. These weaker particles are removed, which results in a dull spot on your floor. Over time, your stone floor may lose its polish if it's subjected to enough materials that can leave etch marks. To restore the polish of your floor, it must be ground down and rebuffed to a high-gloss finish. Some stones may be more difficult to bring to a high polish than others; gabbros, which are very hard stones are more difficult to polish than marbles, for example, which mean the cost to polish these types of floors are higher. Other issues may include polishing green marbles, which contain serpentine, and therefore cannot be exposed to high levels of moisture, as well as the type of finish you want, high hone or true polish, and how much damage the floor had withstood prior to polishing. The average cost of polishing a stone floor is around $2 per square foot for regular maintenance polishing, and $7 per square foot for restoring a damaged floor back to a polished finish. For the average project of polishing a 200 sq.ft. stone floor the total cost will be around $600. There is no true guide for just how polished or shiny you can get your stone floor. Some softer stones, such as limestone 1, may not be able to be polished beyond what is called a "high hone" or a very soft sheen or low gloss finish, which achieved through the same polishing methods as harder stones. Some very hard stones may be able to achieve a very high gloss finish. Typically, the harder the stone, the higher the polish that can be achieved, and the longer that polish will last. So stones such as granite will achieve a higher polish than stones like limestone 1. A few stones cannot be shined or polished at all. Limestones 1 such as Lagos Azul and Jerusalem Gold and travertines like Noce are typically honed and in some cases given a "high hone" finish rather than a polish. These very soft stones can only be given a matte or traditional honed finish, because their surface cannot be ground down enough. Always check with the manufacturer or the stone polisher to find out if your floor is naturally matte before having a polishing treatment applied. Granite Yes $3 per sq.ft. Marble Yes $2 per sq.ft. 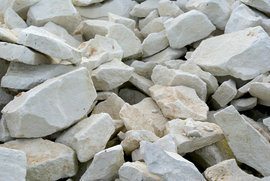 Limestone 1 Some stones only $1-$2 per sq.ft. Travertine Some stones only $1-$2 per sq.ft. 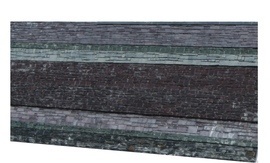 Slate 2 Very few can be polished $2 per sq.ft. Terrazo Yes $3-$7 per sq.ft. Often, the first step to polishing the stone is cleaning it. All stone is porous, and most can be subject to staining, as well as etching. Deep cleaners and poultices may be necessary to help remove some of the tougher stains prior to polishing the floor. Without cleaning the floor first, you will simply polish most stains, as stone absorbs most of what it comes in contact with. In most cases, the cost of cleaning is included in the cost of polishing. For stones that have no stains, but have etched, expect to pay between $1-$2 per sq.ft. For stones that are extremely stained, damaged, or etched, you may expect to pay up to $7 per sq.ft. to clean and polish the floor. Depending on the type of floor you have, the type of wear that has occurred, and the company you hire to have the work done, you may find that your floor can be polished using one of a few different methods. Costs do not vary tremendously between methods on floors that have similar levels of wear, however extremely damaged floors may require more invasive treatment, which can drive up the price. Grinding, Honing, and Polishing All stones, heavily damaged stones, hard stones like granite $5-$7 per sq.ft. Buffing with polishing compounds All stones, particularly good on marbles $3 per sq.ft. Diamond polishing Marbles and granites $3 per sq.ft. Powder polishing All stones depending on the chemical used $2-$3 per sq.ft. Crystallization Marbles and granites, avoid using on green stones $1-$2 per sq.ft. Except slates 2 and gabbros (black granites) all stones should be sealed with an impregnating sealer to help impede staining. A silicone-based impregnating sealer fills the pores of the stone, and gives you time to wipe up spills. Some topical sealers can also enhance the polish or shine of the stone. Impregnating sealers should be reapplied yearly; topical sealers may require more frequent application to maintain the color shine of the stone. Most stone polishers, installers, and fabricators will apply a coat of sealant at no additional cost; you can also apply the sealer yourself for between $10 and $50 a bottle, depending on the type and the type of stone you are sealing. For a stone floor in very bad condition, it may require replacement. Replacing one or two stones is generally not done, unless you have extra tiles left over from the original dye lot. Stones vary too much between lots to be able to install new tiles from a new lot into an old floor. You can expect to pay around $15 to $30 per square foot installed for a new stone floor. Whenever possible, use a stone cleanser meant for the type of stone floor you have, stone cleaners are available for around $20 a gallon from the same dealers you purchase your stone from. Otherwise, use a PH neutral cleanser on your floor at all times to help preserve the current finish, and prevent etch marks caused by acid or alkaline contact. The average cost of a tile floor is around $33 per square foot installed, including the tile, setting material, and installation. The average cost to clean tile and grout and apply a sealer is around $475. 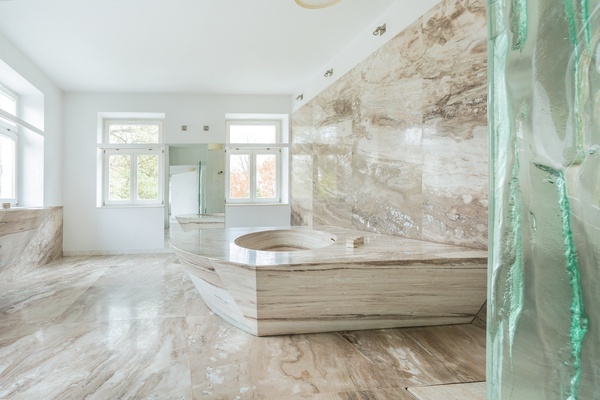 How much does it cost to put marble floors? The average cost of marble flooring is $9 to $12 per sq.ft. installed. How much does a bag of grout cost? A 25lb bag of sanded grout costs around $16. The average cost of installing hardwood flooring is around $4,000-$5,000 for 200 sq.ft. The average cost of installing carpeting is around $1,200-$1,400 for 250 sq.ft. How much does it cost to polish a stone floor in my city? Cost to polish a stone floor varies greatly by region (and even by zip code). To get free estimates from local contractors, please indicate yours.